Like many of my fellow professors, I feel the pressure of having to continuously write scholarly papers, present them at academic conferences, submit them for peer review and publish in highly-ranked journals. I share the same responsibilities: I lead a 19 people research team in a multiple-institutions, collaborative, large-scale, multi-method research project on water conflict in Mexico. I have Masters’ and PhD students whose thesis I need to read, comment on, help refine and on top of that, I contribute service to my discipline(s), my campus, my institution and the global academic community. The other day, I found myself arriving to campus and walking to my office while talking on the phone, holding the phone on one hand while signing administrative forms with the other. A few months back, I reported on Twitter how I actually had so much stuff to do on campus that I literally did not have one second to eat lunch. I share the same pressures, even though I am single. I can’t even begin to grapple with the challenges facing academic parents/students and those who need to engage in care work, on top of everything else they have. I’m busy. Super busy. Enjoyably ultra-busy. But one thing I can’t justify is NOT reading, because I have so much work to do. The two things I do Every Single Day is read (at least one journal article, book chapter) and write (however many words, sentences and paragraphs I can). I am tired of the trope that “the time we spend reading isn’t #AcWri“. I am, sometimes, guilty of spouting this fallacy myself. Reading is inherent in “writing” — we must read to write and place our research in the literature appropriately. So reading sort of “counts” as writing and isn’t a “just”! @raulpacheco wins writing by reading! To test this trope, last week (January 1st-5th, 2018) I experimented with literally writing out of thin air. I sat down and started typing words related to specific papers and books I’m writing. I was able to crank out 2545 NEW words in 5 days, which is what it is — as I’ve said before, I’m not obsessed with word count. I will leave the discussion on producing new words, edited words and revised words for another blog post. I wrote 2545 words without using a prompt to help me write. This process was PAINFUL. I did not allow myself any reading. I was simply supposed to WRITE. This week (January 8th-12th, 2018) I wrote stuff that was associated with several of my projects, BUT AIDED BY PROMPTS, specifically articles I had already read, or that I was reading to prepare my lecture on intractable water conflict. This integration really facilitated my progress, which I’m measuring not by the number of words I’ve written so far, but by the fact that I have begun to really grapple with some rather challenging concepts in water conflict (such as the fact that cooperation isn’t necessarily the lack of conflict). 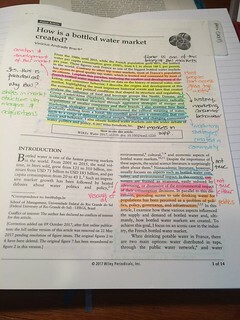 It’s really important that we realize that reading IS legitimate, and engaged reading (such as highlighting, scribbling on the margins, writing handwritten or typed notes about a journal article, book chapter, book, report, or even data table) IS part of the writing process. Reading is INTEGRAL to the academic writing process. Good point! Ppl forget that reading is fundamental part of the process. Focus on "words" as achievements takes away from that I think. Should maybe think of writing more as a holistic process that involves reading, planning, structuring even before actual words on the page? To share another example: this morning (Friday, January 12th, 2018) I woke up, got my coffee and spent 2 hours reading Bar-Tal’s (2000) journal article on intractable conflict resolution and reconciliation. Reading this article, highlighting key passages, finding relevant quotations, and writing (by hand) important ideas. I normally do a combined AIC Content Extraction/Conceptual Synthesis Excel Dump entry, but I knew reading Bar-Tal would give me many key ideas so I chose to do deep engagement. Doing this allowed me to find some key ideas that I think are relevant not only to the class I’m preparing and to the topic I’m lecturing on tomorrow, but also to my own research and that of my lab. 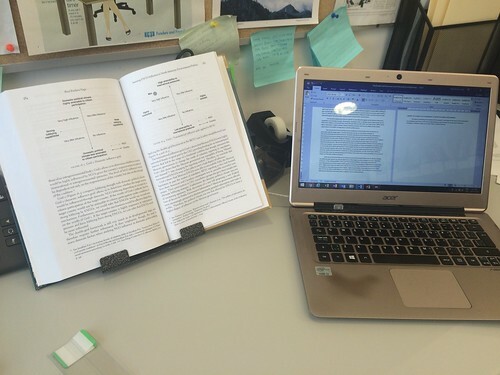 Taking the time to really sit down and read, and engage deeply with the Bar-Tal article really allowed me to create new ideas that I am sure will further my project and help us move forward, both conceptually and methodologically. In sum, the entire point of this blog post was to remind my fellow scholars (and myself) that reading is an integral part of writing, and that if we don’t read, and make time to read, we will probably not be able to situate our scholarship within the global scholarly literature. I know we are all busy, but if I may be so bold to suggest, I strongly believe we ought to make time to read at least one journal article or book chapter a day. I know this is tough. I spent 2 hours on this particular article and I am 3 pages in (I’m doing deep-engagement instead of a simple AIC Content Extraction)! But that’s because I’ve also spent time tweeting about it and mulling over the ideas I’ve been reading. I’ve written about this topic extensively, so here I’ll just close by sharing this post on 8 strategies to carve time to read during the semester.